Welcome to the third part of the sharp and flat harmonic minor scales lesson series. This time we will learn the F#/Gb harmonic minor guitar scale. Let’s begin by playing the root note of the F#/Gb scale on the 2nd fret of your E6 string. 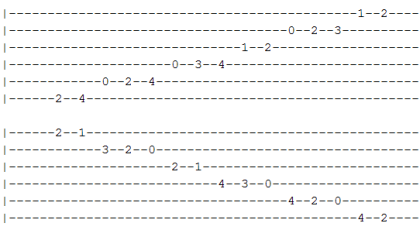 Then play along until you reach the final note of the first set, which is on the 4th fret of the D4 string. You can keep playing until you reach the final note of the second set – on the 2nd fret of the E1 string, to get a more complete exercise. Let’s try another pattern. The figure below tells you to begin playing on the 14th fret of the E6 string, and then play through two sets of the scale until you reach the final sound on the 14th fret of the E1 string. This is yet another scale perfect for exercising your fingers, their speed and strength. If you want to learn more you can visit all-guitar-chords.com and get the full pattern for the F#/Gb harmonic minor scale (click here).